To remain competitive in a global marketplace that is changing rapidly and continually, employers need the innovation that individuals who display high levels of curiosity can bring. Employees who are naturally curious ask lots of questions, propose new ideas and challenge tradition. They aren’t afraid of trying—and failing—if that’s what it takes to find solutions to problems and develop new products and services. Employers and senior leaders can foster more curiosity in their teams by understanding and removing the four factors that discourage it. In her research on curiosity, author, nationally syndicated radio show host and #SHRM19 speaker Dr. Diane Hamilton found that four factors hold people back from being curious, and she created the acronym FATE (Fear, Assumptions, Technology and Environment) to make it easier for employers to remember—and remove—these curiosity destroyers from their workplaces. Fear: People avoid exploring new areas or asking questions due to a fear of failure, embarrassment or a lack of control. That is why emotional intelligence has become such an important topic in the workplace. In a work environment where empathy and interpersonal skills are not developed, people will continue to fear ramifications for asking the “wrong” question. Assumptions: Many of us shut out opportunities to learn new things because we assume we won’t be interested in something, or it is boring or unnecessary. A little voice in our head tells us we won’t be interested. By recognizing that we have that voice, we can take the first step toward developing our curiosity. Technology: Sometimes technology can do so much for us that it keeps us from looking into how the answers to certain needs were discovered, or it can be so overwhelming that thinking about learning how to use it can make us shut down to the opportunities. When companies meet technology-training needs on an individual basis, if necessary, rather than letting people fall behind, that is a big first step to getting people to embrace the possibilities. Environment: Our environment can include our family, educators, colleagues, peers and friends. When we are surrounded by people who don’t have time to answer our questions or who have ideas about the things we “should” or “should not” do with our lives, that can impact our desire to ask questions and explore new opportunities. The desire to fit in can kill dreams. How are you hiring for—and developing—curiosity in your organization, and how are you crushing the FATE that kills it? Please join @shrmnextchat at 3 p.m. 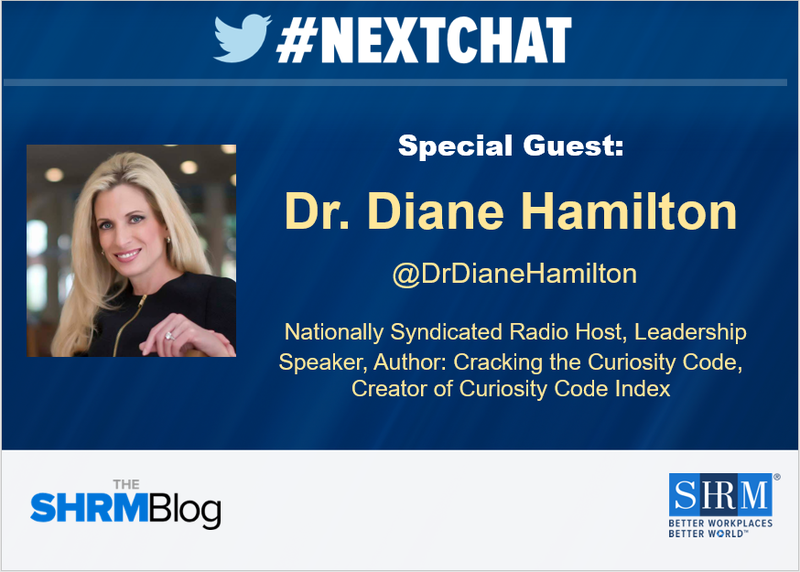 ET on April 17 for #Nextchat with special guest, #SHRM19 speaker Dr. Diane Hamilton. We’ll chat about how you can foster a culture of curiosity in your workplace. Q1. What are the attributes of organizations that encourage cultures of curiosity? Q2. Workplace environments can impact our desire to ask questions and explore new opportunities. What are signs that your workplace environment inhibits curiosity? Q3. Fear inhibits curiosity. What are some tangible steps employers can take to help employees feel empowered to ask questions and exhibit curiosity without fear of failure, avoidance or embarrassment? Q4. Technology can inhibit curiosity when it provides all the answers or is overwhelming. How can employers use technology to help encourage curiosity? Q5. What are some ideas for programs, games or activities that leaders can implement to encourage more curiosity in all their employees and teams? Q6. How can individuals improve their own level of curiosity? What exercises or habits can they develop to help them to be more curious—especially in the workplace? Q7. How can curiosity be used to improve engagement in workplaces? Q8. What are some ways employers can recognize and reward curiosity to advance innovation in their workplaces? See Dr. Diane Hamilton at #SHRM19 as she presents the Mega Session How to Build Curiosity to Improve Innovation, Engagement and Productivity, on Tuesday, June 25, 3:30 p.m. - 4:30 p.m.